This barbecue chicken liver recipe makes for a great appetizer so please don’t say you’re going to throw them away! 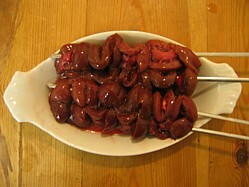 It’s a very popular tapas dish in Andalucia, Southern Spain and also can be done with lambs kidneys. We first discovered it in a bar in Granada, one of the very few cities left in Spain where tapas still comes free with your drink. 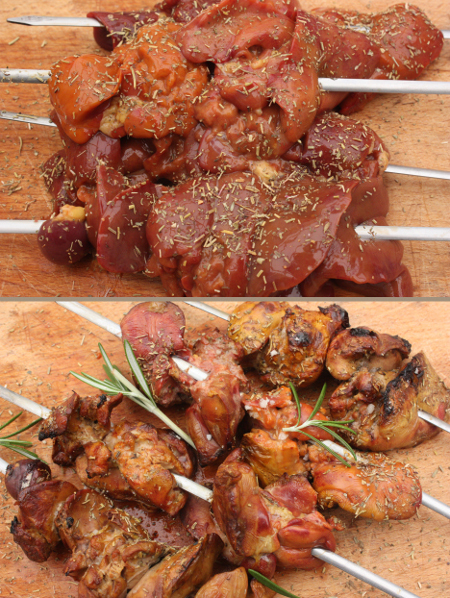 It wasn't such a big skewer as the one that I've prepared just two or three pieces on a stick and they tasted fantastic. The key flavor to this recipe is Sherry or Jerez the Andalucian fortified wine and it really brings this dish alive. You need a dry sherry for this recipe so look for a Fino or Amontillado and if you can't get sherry then a dry white Port works equally well. You can see in the picture that I've done it with kidneys this time around and all you have to do is thread them onto the skewers and make up the dressing. 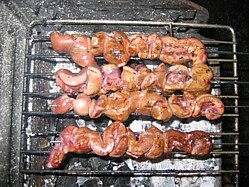 If using lambs kidneys, slice then in half longitudinally first and remove the bitter white core.Soak some bamboo skewers for 30 minutes and then thread the meat onto the skewers. You need to make up two bowls of the sherry mix because one half will be used to baste the meat (and so will be contaminated with raw meat) and the other half will be heated and poured over the cooked meat. So in one bowl add half the sherry, half the oil and all the sugar. Use this to brush onto the meat throughout the cooking process and sprinkle on the seasoning. In the other bowl add the remaining sherry and oil and allow this one to warm through on the barbie. You don't have to bring it to the boil, just up enough so that its a similar temperature to the food. This barbecue chicken liver recipe just takes about 10 minutes to finish off over medium hot coals. Turn them every 2-3 minutes until caramelized. When done serve them on the skewer with the flat leaf parsley or rosemary for garnish and drizzle the second bowl of warm sherry and oil over the top.